The Bundoran Shales were deposited during the Carboniferous Period (345 – 280 Ma). Before this time there was a large ocean called the Iapetus Ocean. Separating the Northern and Southern halves of Ireland. Over time, from 600 – 400 Ma, this ocean closed and in process created a mountain chain known as the Caledonides in Ireland and Scotland.These land masses provided the raw material from which the Bundoran Shales and related formations are composed. At the beginning of the Carboniferous Period (345-280 Ma) when the sea level began to rise, the shoreline moved northwards from Cork flooding the land as it passed. This Carboniferous marine transgression resulted in the deposition of shallow marine sandstones in this area. During this time Ireland was close to the equator and experienced a tropical climate. At first the Ballyshannon limestone was deposited in a clean, shallow, tranquil sea, teeming with life. However limestone deposition was interrupted due to uplift and erosion in the north and a resultant marine transgression from the south followed by the building of a major river delta out into the tropical sea. River systems carried muds and emptied them into the troughs formed by folding brought on by the earlier ocean closure as well as the activation of an older fault system relict of the Caledonian orogeny. This event saw the deposition of the Bundoran Shale Formation followed by the Mullaghmore Sandstone Formation. The Bundoran Shale is spectacularly exposed at its type locality at Bundoran and the formation gets its name from this location. The Bundoran Shale Formation is part of a larger sedimentary sequence known as the Tyrone Group which includes the following succession (i) The Ballyshannon Limestone (ii) The Bundoran Shale Formation (iii) The Mullaghmore Sandstone (iv) The Benbulben Shale Formation (v) The Glencar Limestone Formation and (vi) The Dartry Limestone Formation. These formations are made up of limestones, shales, sandstones, mudstones and siltstones representative of a range of deltaic environmental conditions. The bottom unit, the Ballyshannon Limestone rests on a basal conglomerate of clastic boulders indicative of terrestrial, tidal and shallow marine environments. These lie unconformably on the underlying basement rocks. The shales have a lateral extent of approximately 2000 sq. km and are found in counties Sligo, Leitrim, Cavan, Tyrone and Fermanagh as well as Donegal. Vertically the succession varies and is about 650m at its thickest. These facts give some indication of the size of this surface feature and in today’s terms we would be looking at a delta system as large as any present now and which is also supplied with sediments from mountains as tall as today’s Alps. At Bundoran there is about 150m of cliff exposure. 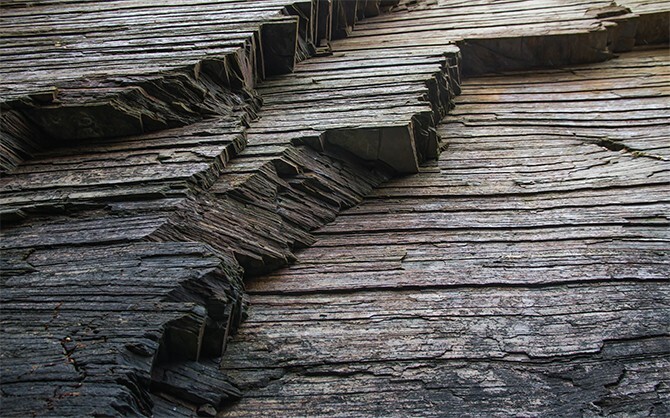 The formation is generally made up of thinly bedded shales and limestones. The Bundoran Shale formation comprises dark grey, fissile, calcareous and micaceous laminated mudstones and siltstones interbedded with thinly bedded blue, grey to dark grey bioclastic limestones. Some units of the limestones may be classified as packestones or grainstones. At Bundoran the basal section outcrops at Aughris Point where the Shales overly the massively bedded Ballyshannon Limestone. Beware of this place as the slopes are treacherous when wet and extremely dangerous with a high risk of falling off. The bottom section generally contains interbedded shales and thin lenticular limestone beds which are rich in macro fauna such as corals and brachiopods. There are large concentrations of broken remains of crinoids (in particular), bryozoa, coral and brachiopods. Thin sections below shows wealth of microfauna in the section also present. The presence of the fossil foraminifera such as Paraarchaediscus at the involutus stage which indicates a mid to late Arundian age+ (340 Ma approx.) By and large the central portion contains finely laminated shales rich in microfauna as with occasional limestone beds, some exceeding 30 cm in thickness. At the top of the sequence the fossiliferous shales and limestones, coarsen up and are gradually replaced by siltstones, very fine sandy siltstones, heterolithic siltstones and sandstones and finally by dark grey fine-grained silty sandstones.